The Iranian nuclear negotiations are among the most volatile arms control and international affairs topics in the news today, with commentators predicting success or failure in equal measure. Additionally, the current sanctions fight in Congress could have far-reaching implications regardless of whether or not Iran and the P5+1 reach a solution. Therefore, the event The Endgame: Success or Failure in Iran Nuclear Talks (hosted by the Institute for the Study of Diplomacy in mid-January) was particularly informative. 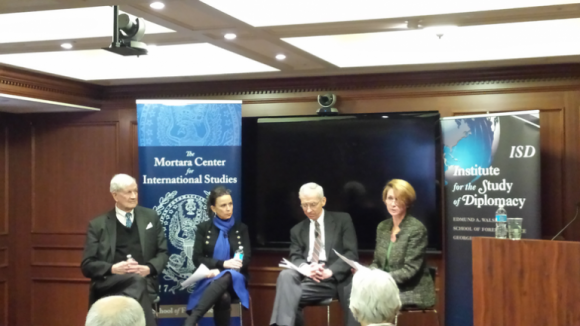 Ambassador Barbara Bodine moderated a panel consisting of Robin Wright, Paul Pillar, and Ambassador Bill Luers. Luers and Pillar are on the board of directors of The Iran Project (one can find their reports here). American and Iranian political concerns make the coming weeks particularly important, regardless of the status of a deal. All three speakers brought up the political bind the Iranian regime is currently in, and emphasized the divisions within it. Negotiation breakdown would undermine Rouhani and the moderates by allowing the conservatives to prove that the West has no interest in diplomacy. Success, however, carries multiple risks for the regime as a whole. Rouhani’s returning home with a legitimate deal would solidify Persian public opinion on the side of the moderates, and give the President a large degree of political power with his newfound popularity. Rouhani could channel that power into a liberalization campaign that could undermine the revolution. A deal would force the Ayatollah to choose between the diplomatic future of Iran (as negotiation success would open up the regime to a host of other positive relationships), and the continuity of the revolution. The role of the IRGC in such a situation is unclear at best in such a struggle between Shia sentiment, liberalism, and Persian nationalism. The goals of the (as Fouad Ajami termed them) “turbaned savior[s] from Qom” are unclear at best. American political concerns also play a significant role in the fate of the negotiations. Although Congressional Democrats have pulled their support for a new sanctions bill, diminishing the probability of a veto-proof majority, legislation remains uncertain, and the differences between Democrats and Republicans on this issue are narrowing. Republicans will almost certainly oppose a successful deal, which will allow the President to enact it as an executive agreement until he leaves office, giving the US an 18-month period to test-drive the new relationship with Iran. Pillar observed that any American actions undermining the deal would lead to the dissolution of international pressure on Iran, since the U.S. would be the belligerent party. This indicates that the most dangerous phase of the process could be post-deal, with Republicans attempting to pass sanctions legislation that could eliminate diplomatic options and lead to a military confrontation. Robin Wright made several observations on Iranian youth liberalization. Sustained population-control rhetoric from the regime along with a comprehensive public education system has created a generation that had educational support, and as such, is currently politically aware and engaged. This engagement has driven Persian youths to connect with the West, both via social media and other outlets (including Tehran’s underground music culture). The political awareness of Persian youth makes negotiation success even more important for a regime attempting to demonstrate it can liberalize. Pillar also remarked upon the United States’ need for a strategic adversary, especially following the fall of the USSR. U.S. citizens and policymakers have therefore demonized Iran to ensure the existence of a direct enemy. This view will undermine the ability of the U.S. to accept a deal on the nuclear issue, although, as Amb. Luers observed, the aforementioned “test-drive” period could help legislators and civilians acclimate to the new (old) relationship. In addition, although a deal could ease tensions, it would not normalize relations, allowing the U.S. and Iran to engage in a U.S./Russia-style tense peace, which could make a deal more palatable. Finally, other actors could become the new “enemy,” namely the Islamic State (IS) (or Russia, depending on developments in Ukraine). One set of overlooked parties in these discussions has been America’s Middle Eastern partners outside of Israel. The current political noise over PM Netanyahu’s upcoming speech has drawn more attention to Israel, and away from Arab nations. Like Israel, Saudi Arabia and the other Gulf States fear an Iranian nuclear program, particularly because of religious tensions between the Sunni Saudis and the Shia Iranians. Partners that do not particularly object to the nuclear program, such as Jordan, may be wary of increasing Iranian power (considering the view that the Islamic State is a reaction to Persian expansionism, and that Sunni infighting obfuscates the true strategic goal). Increasing Iranian influence could pose a threat to multiple Arab allies. Luers contended that these misgivings could further impede a deal, whereas Pillar asserted that the reliance of the aforementioned states on the United States for security would ensure their cooperation, despite public protest. All these observations indicate one simple fact: the coming weeks will be critical to shaping U.S. regional, and arguably global, policy. Alternatively, there is a very simple way to frame the issue: is the Iranian Supreme Leader ready to sign up to a deal that would amount to an abandonment of any short to-medium term military nuclear ambition/capability? Also, I find the comments about the US needing to “demonize” Iran quite puzzling. It’s really a pot/kettle issue. The political DNA of the Islamic Republic is to consider the US as “the Great Shaitan”. I am struck by the zero-sum thinking in the second paragraph: If Iranian moderates win, then conservatives must lose. If Iranian conservatives win, then moderates must lose. The political elites must find a way to rephrase this as a positive sum game, where everybody can win something, even if some still grumble at not getting everything they wanted. Similar thinking seems to pervade U.S. politics, though hopefully not as severe, where Republicans are determined to checkmate Obama, even before they have seen the terms of any deal. I also don’t see how “A deal would force the Ayatollah to choose between the diplomatic future of Iran … and the continuity of the revolution.” Rather, consolidation of a long-term theocratic “revolution” requires accommodating democratic principles, not forcing a clerical or military dictatorship onto the Iranian people. It is not an either/or proposition. Winning the “revolution” requires respecting both the Iranian people and the outside world, and the desire of the Iranian people to be on good terms with that outside world.